Please note that we can only supply this machine within travelling distance of our store in Lancashire, call us to check on 01254 389171. 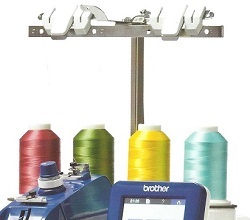 The incredible VR from Brother is the most versatile free motion and embroidery machine. Once again the design team at Brother have come up with a stunning idea and brought it to magnificent reality. 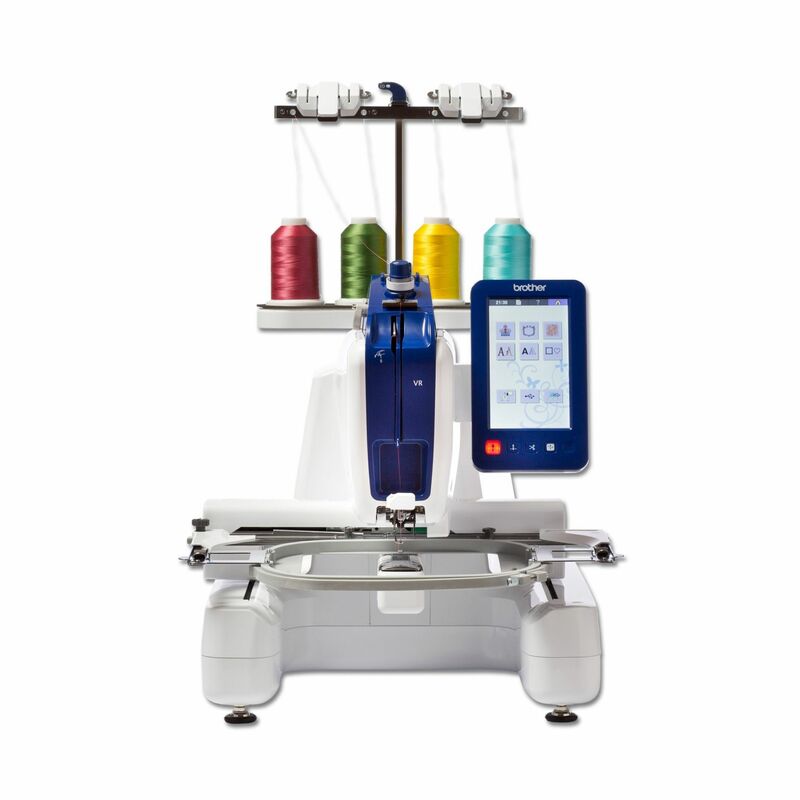 Firstly, the VR will produce the crispest, high quality embroidery of a professional standard, at high speed if you want to, and will allow you to hoop up flat fabrics as well as tubular items (pockets, cuffs, trouser legs etc) because it has a wonderful free arm. Secondly, it converts very quickly and easily into a truly awesome free-motion quilting machine and the beauty is two-fold. You can slide your fabric in any direction without the restriction you get to the right of needle with a standard machine AND the stitch quality is supreme on both top and bottom of the fabric with the VR capable of handling multi-layers with ease. 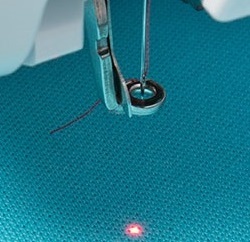 The LED pointer makes it easy to see exactly where the needle will drop allowing you to position your designs perfectly on the fabric. Thread the needle in seconds with the press of a button. 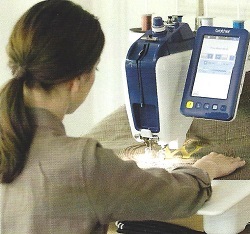 One of the industries easiest threading systems, the same system as on the multi-needle professional models. "Anytime" access to the vertical bobbin located at the end of the tubular arm lets you easily change the bobbin without having to remove the hoop. The slim arm is capable of going inside trousers, pockets, sleeves and bags. 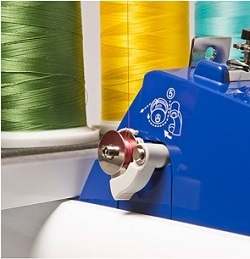 Conveniently holds 4 spools of thread so that your next colours are to hand and speedily changed. Just tie your new colour to the end of your previous colour and pull through the machine it couldn't be easier! 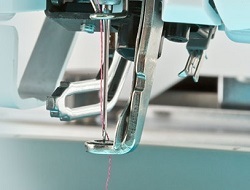 Yes, ingeniously, the built-in independent bobbin winder allows you to wind a new bobbin while the machine is embroidering - you can also use pre-wound bobbins too. 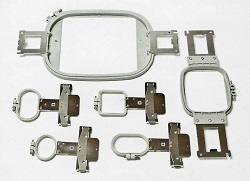 Of course you'll need the correct frame for your project and these are standard equipment. You can also buy round frames, cap frame and border frame too if you want to create a fully featured home business. When you have combined designs that use the same colours just have the machine sort them for you so that you don't have to keep re-threading the same colour. The machine automatically stitches the design by colour order so you only thread that colour once into the machine. This great feature alone can save a huge amount of time!!!!! 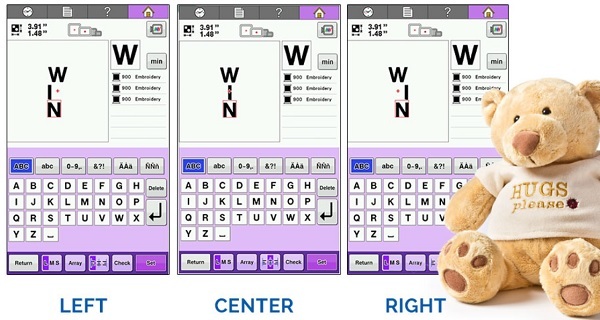 The new "enter" key to the right of the keyboard screen starts a new line of text below the previous line which can be left, centre or right aligned. Great for verse, name & date quilt labels, wedding and birthday embroideries - basically any project that needs multi-line wording. The VR is a lot faster when stitching compared to a conventional domestic embroidery model because the machine design has been developed from the commercial PR range, ensuring the best-quality embroideries and virtually snag-free stitching on even the most challenging projects. An upgrade kit is supplied free with the VR which includes large table, free motion grip, foot control and free motion presser foot. This takes seconds to attach and provides a perfect free-motion envionment. 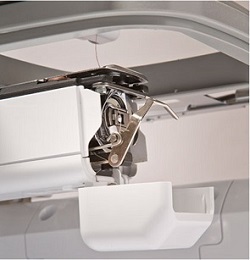 Conventional flatbed sewing machines can be restrictive to the right of the needle, not so with this fabulous creation. And because this isn't a "swing needle" machine the stitch quality is gorgeous and multi-layers are a tangle-free breeze. Includes a 3-year domestic warranty. Call or email us on 01254 389171 and info@lordsewing.co.uk. I have had this machine 6 weeks now. All I can say is WOW! 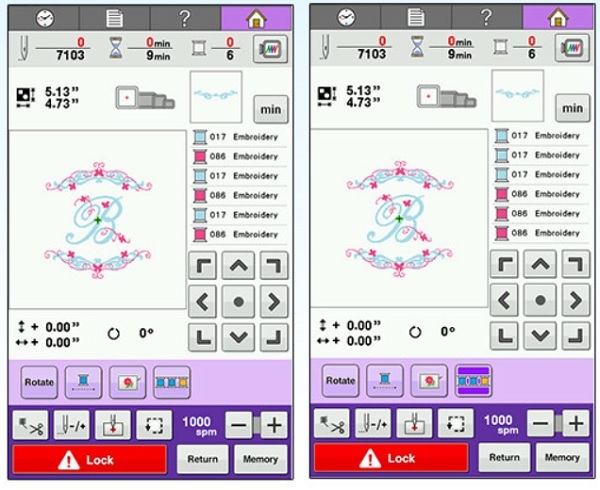 The machine is very well designed, the instructions are easy to understand and if you have used an embroidery machine before you will find it very intuitive. I have tested it on designs from many sources and all have stitched out perfectly with hardly and thread breaks due to the straight line threading. The VR gives me all I needed from an embroidery machine. I would just like to be able to stitch up to 12", but perhaps this may come on an upgrade. Transferring and editing designs is simple using USB. Many thanks to Keith for going the extra, several hundred, miles to bring me my machine. Exceptional service. Highly recommend if you love machine embroidery. My machine appeared as if by magic...delivered and set up by Keith all as part of the service. Clear and comprehensive advice both beforehand (where it could and couldn't go) and on installation. Thorough lesson in threading, hooping, maintenance, embroidering and free-motion. Stitch quality is superb. The substantial hoops are easy to use and cover most smaller sizes. The LED means that split designs are also easy so larger designs can be done. It is a heavy machine and there is a certain amount of vibration so it needs a strong table or stand. Wonderful!! !